I have to admit, I have always eaten Belgian Waffles a little differently than everyone else. Unlike the majority of people that probably like their waffles sweet, I tend to prefer mine totally different. For the sake of typical presentation, and how my wife likes to eat her’s, I will show them with Butter and Lakanto Maple Flavored Monkfruit Syrup on them. I on the other hand like to eat mine with sausage patties, 4 over-easy eggs (one on each waffle section) and Jalapeno Tabasco sauce. Maybe I was just born to be Keto, LOL! If you have tried our hugely popular Keto Pancake Recipe before, this recipe is very similar. You could make this with 1 & 1/2 Cups of Almond Flour instead if you prefer, but we figured for this recipe we would feature Coconut Flour and also flavor these a little differently. 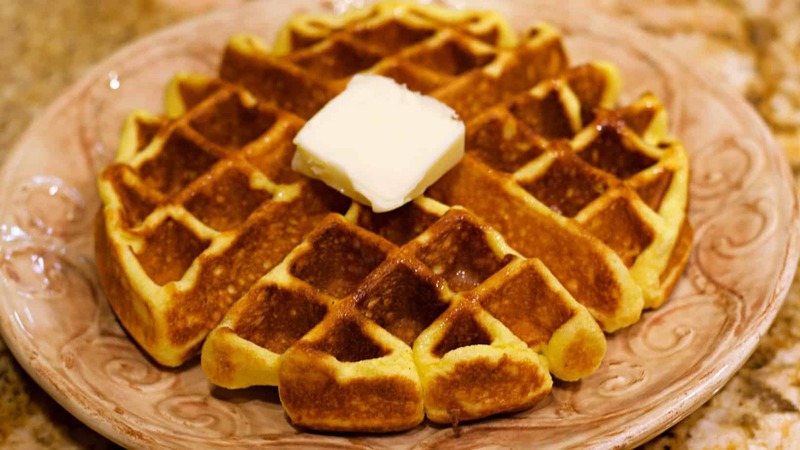 This produces a thicker batter, which makes the waffles very fluffy and full too. If you follow the recipe as written you should get 3 Full-size Belgian Waffles out of it, depending of course on the size of your waffle maker at home. 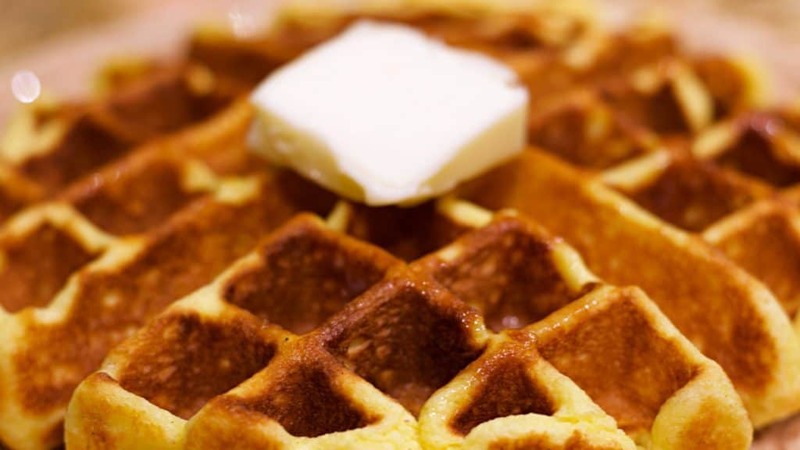 If you like your waffles a little crispier than fluffy, you can opt to add some oil to the waffle mix too which will help crisp up the outer edges. Once you get these bad boys out of the waffle iron you will want to top them and eat the right away. Feel free to top them with some fresh blueberries or strawberries and some homemade whipped cream if you prefer that over butter and syrup. Or try them my way with the sausage, eggs, and hot sauce! Pour the 1/3 Cup Coconut Flour into a Large Mixing Bowl or a Food Processor. Place the Softened Cream Cheese in next. Pour the Maple Flavor on top. Crack the 6 Large Eggs and add to the mixture. Add the Lakanto Monkfruit Sweetener, Baking Powder, and Xanthan Gum, and blend thoroughly. Pre-heat your Waffle Iron, and spray with either Avocado Cooking Spray or your preferred Non-stick spray. You will probably need to cook this waffle on the iron’s darker settings, about 3/4 of the way dark is about right on our Waffle Iron. Cook for about 4 minutes or until the Waffle Iron tells you it is ready. Plate them and smother with butter, or toppings of your choice. If you like the flavor of Maple Syrup you should consider the Lakanto Maple Flavored Monkfruit Syrup. Optional: If you want your waffles a little crispy you can add some extra oil to this batter too. Additionally, you can experiment with adding different flavoring extracts or spices to the mix to make them taste the way you like. Sometimes we add pumpkin spice mix for a seasonal flavor, other times we may add Pecans or Lily’s Dark Chocolate Chips for some variety too. Vonnie, I do not have my own cookbook, as my site IS my cookbook! Those ads must be ones that Google is showing to you. Glad you asked! I thought the ketosis cookbook with 370 recipes was your cookbook and these wonderful recipes were a teaser to purchase your book. I’m so glad to see that asked and answered. Thanks for the great recipes and videos. Can you freeze leftover waffles? If not how long good in frig? What is the carb count on al,old flour in this recipe, if I substituted? And what is the serving size? Sorry for all the questions…. 1 Serving Size is 1 Cup of batter, which makes one full Belgian Waffle, so no partial waffle servings here in this recipe. I have never tried to freeze them, but if you ahve frozen other waffles before I imagine these would freeze just as well. If you swapped over to Almond Flour you would need to use 1 & 1/2 Cups of Almond Flour. Almond FLour would give you 1-2 more net carbs per waffle roughly. Why can’t you simply substitute one flour for another? Why are the measurements different? Because of the moisture absorbtion properties of the two flours. Almonds are pretty much non-pourous and do not absorb much, and coconut flour is like a sponge. Can you store left over batter in fridge til following day? Maybe. I don’t think any of the ingredients would go bad, but they might get really firm in the fridge. Melissa, There is a ton of information out there on the ketogenic diet and why it is healthy and helps you to lose weight. The basics are less than 25 grams of carbs per day; 80 % of your daily caloric intake from healthy fats, and moderate protein. Use coupon code KETODAILY for 20% OFF if you order there. Surprisingly Not. They are nice and fluffy. You could make them crispier if you want by increasing the oil in them too. That’s all up to personal preference really. Try an extra TBSP at a time until you get it the way you like it. Still can’t quite get my head around how cheese and flour = batter! WOWZERS, these were incredible!! i used almond flour instead of coconut flour. i also do not like sweet on my waffle, so i whipped these babies up and then made bacon grilled cheese sandwiches with them! i have lots left over because i doubled the recipe, so in to the freezer they go. thanks for the super duper recipe!! Did you make the waffles and then use them like bread for grilled sandwiches? I gave my waffle iron to my daughter, I thought I would not have a use for it on keto! Well, I might try to make these as pancakes, making them low and slow. I’ve even thought about using the waffle iron to make Chicken Schnitzel, as if it was a lattice shaped George Foreman grill, LOL! You can minimize the egg flavor in any egg related recipe by allowing the eggs to sit on the counter and get up to room temp before using them. the colder the eggs the stronger the flavor typically. Can you substitute the sweetener for swerve or stevia instead?